The Earth Ball - the actual ball is called Earth Ball, because like your common globe, all continents including their many countries are printed on it. However, the ball is also known as Push Ball, which is available in several different versions. This large plastic ball is made from a sturdy vinyl or with an internal rubber bladder with a strong external material. Since those balls are not really cheap, it is advisable to handle them with some care; however, that is not possible with all games. Nevertheless, these ball games are great fun, promote team spirit and are very creative. Needless to say, the Earth Ball is not an item, which is part of every gaming equipment. Even this particular piece of your equipment is quite expensive, it is definitely worth to obtain it. Maybe this Earth Ball could be purchased together with small donations or with the help of parents. Another way to raise money for the ball could be a fundraiser where every child can be involved and therefore learns “working” together for something is fun and can get you the desired item faster. The Earth Ball is available from well-stocked toy stores or on the Internet, where they can be ordered from overseas; sometimes even cheaper. I just looked them up on EBay they are available between $ 40 -60. 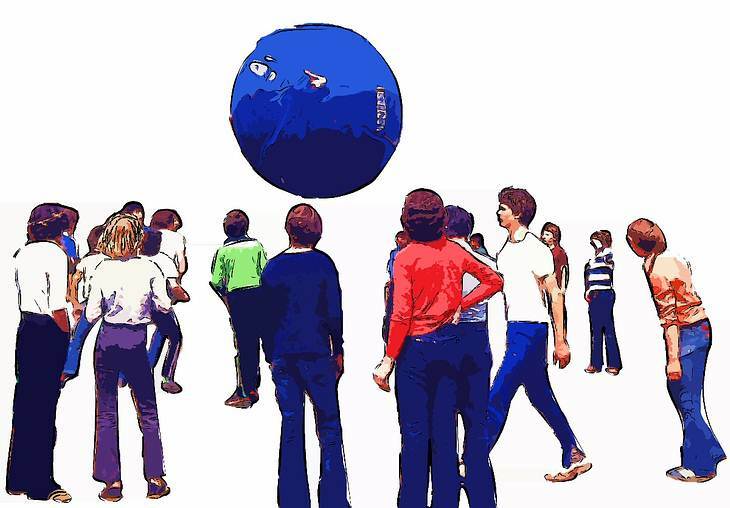 Games, using the Earth Ball, can be very valuable in terms of physical challenges as well as their pedagogical significance. Playfully children learn geography from the printed continents on the ball’s surface. In many cases they don’t even realize how the conveyed facts become part of their knowledge. It gives children the opportunity to really live it up and get rid of excess energy. In sporting terms, the Earth ball is also known as Push Ball. It can be used for gymnastics and even simply kicking it can be quite an effort. This helps to strengthen muscles, tendons and joints. Games, where the ball has to be moved with the effort of the entire group, reinforces team spirit, consistency as a group, as well as confidence in oneself and all other members of the team. There is no particular risk of injury using the Earth Ball. It is the task of the team leader to make sure the game does not get out of hand and therefore becomes too violent as well as that younger or smaller kids are not disadvantaged and everyone gets a go. Each team tries to push the ball in the opponent’s goal. Let the wild tossing begin! Each team has its own field. Using 1-3 balls at the same time, each team is required to throw the ball in the opponent’s field. Winner is, who has no ball in his field at the end of the game. All players stand/lay on the ground. The Earth Ball has to be passed on by always keeping the ball above their heads. Alternative: all kids are laying on the floor. Their feet are stretch up into the air and the ball is passed on using only their feet. Basically, this is nothing else but throwing the ball over a rope – however, with the slightly heavier Earth Ball. For this particular game, the net/rope should be sturdy and the rods well secured. The Earth Ball is placed on a parachute. Now several parachute games can be carried out. For example, catapulting the Earth Ball up into the air and catching it again, or run the Push Ball in a circle, without coming off. More parachute games will be listed under the category Parachute Games. The Earth Ball is used as a buck and every kid has to jump over it. All children form a circle. By slightly leaning forwards each player tries to pass the Push Ball on to another player, using only his head. This can be from one to the other as well as passing the ball on to the person opposite you. Using the Earth Ball a slalom around bottles has to be completed. For every fallen bottle the team receives a minus point. The Earth Ball must be rolled back and forth. Or the Earth Ball must be taken back and forth. The Earth ball is used as a buck, like in the Leaping Frog game, however, this time a certain distance has to be covered. You need a fairly sturdy Push Ball. Each kids gets a go, standing on top of the Push Ball, trying to run on the ball. This game only works with a very large group of people. The whole group forms 2 circles. An outer and an inner circle, so that there is an alley between those two circles. Starting on one side of the alley, the Earth Ball is rolled forward, while starting on the other side of the alley, one kid tries to catch up with the ball. Or is it the ball after all, which catches up with the player?